Duloxetine, sold under the brand name Cymbalta among others, is a serotonin-norepinephrine reuptake inhibitor (SNRI) created by Eli Lilly. It is mostly prescribed for major depressive disorder, generalized anxiety disorder, fibromyalgia and neuropathic pain. Duloxetine failed to receive US approval for stress urinary incontinence amid concerns over liver toxicity and suicidal events; however, it was approved for this indication in the UK, where it is recommended as an add-on medication in stress urinary incontinence instead of surgery. The main uses of duloxetine are in major depressive disorder, generalized anxiety disorder, urinary incontinence, neuropathic pain and fibromyalgia. 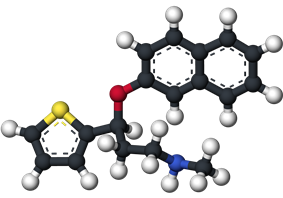 Duloxetine is recommended as a first line agent for the treatment of chemotherapy-induced neuropathy by the American Society for Clinical Oncology, as a first-line therapy for fibromyalgia in the presence of mood disorders by the German Interdisciplinary Association for Pain therapy, as a Grade B recommendation for the treatment of diabetic neuropathy by the American Association for Neurology and as a level A recommendation in certain neuropathic states by the European Federation of Neurological Societies. A 2014 Cochrane review concluded that duloxetine is beneficial in the treatment of diabetic neuropathy and fibromyalgia but that more comparative studies with other medicines are needed. The medical journal Prescrire (based in France) concluded that duloxetine is no better than other available agents and has a greater risk of side effects. Thus they recommend against its general use. Duloxetine was approved for the treatment of major depression in 2004. While duloxetine has demonstrated improvement in depression-related symptoms compared to placebo, comparisons of duloxetine to other antidepressant medications have been less successful. A 2012 Cochrane Review did not find greater efficacy of duloxetine compared to SSRIs and newer antidepressants. Additionally, the review found evidence that duloxetine has increased side effects and reduced tolerability compared to other antidepressants. It thus did not recommend duloxetine as a first line treatment for major depressive disorder, given the high cost of duloxetine compared to off-patent antidepressants and lack of increased efficacy. Generic duloxetine became available in 2013. Duloxetine is more effective than placebo in the treatment of generalized anxiety disorder (GAD). Major guidelines such as Maudsley Prescribing Guidelines, and Canadian Psychiatric Association Guidelines do not list duloxetine among the recommended treatment options. However, a review from the Annals of Internal Medicine lists duloxetine among the first line drug treatments, along with citalopram, escitalopram, sertraline, paroxetine, and venlafaxine. Duloxetine was approved for the pain associated with diabetic peripheral neuropathy (DPN), based on the positive results of two clinical trials. The average daily pain was measured using an 11-point scale, and duloxetine treatment resulted in an additional 1–1.7 points decrease of pain as compared with placebo. At least 50% pain relief was achieved in 40–45% of the duloxetine patients vs. 20–22% of placebo patients. Pain decreased by more than 90%, in 9–14% of duloxetine patients vs. 2–4% of placebo patients. Most of the response was achieved in the first two weeks on the medication. Duloxetine slightly increased the fasting serum glucose; however this effect was deemed to be of "minimal clinical significance". The comparative efficacy of duloxetine and established pain-relief medications for DPN is unclear. A systematic review noted that tricyclic antidepressants (imipramine and amitriptyline), traditional anticonvulsants and opioids have better efficacy than duloxetine. Duloxetine, tricyclic antidepressants and anticonvulsants have similar tolerability while the opioids caused more side effects. Another review in Prescrire International considered the moderate pain relief achieved with duloxetine to be clinically insignificant and the results of the clinical trials unconvincing. The reviewer saw no reason to prescribe duloxetine in practice. The comparative data collected by reviewers in BMC Neurology indicated that amitriptyline, other tricyclic antidepressants and venlafaxine may be more effective. However, the authors noted that the evidence in favor of duloxetine is much more solid. A Cochrane review concluded that the evidence in support of duloxetine's efficacy in treating painful diabetic neuropathy was adequate, and that further trials should focus on comparisons with other medications. The Food and Drug Administration regulators approved the drug for the treatment of fibromyalgia in June 2008. Duloxetine was first reported to improve outcomes in stress urinary incontinence (SUI) in 1998. The safety and utility of duloxetine in the treatment of incontinence has been evaluated in a series of meta analyses and practice guidelines. A 2013 meta analysis concluded that duloxetine decreased incontinence episodes more than placebo with people about 56% more likely than placebo to experience a 50% decrease in episodes. Adverse effects were experienced by 83% of duloxetine-treated subjects and by 45% of placebo-treated subjects. The National Institute for Clinical and Health Excellence recommends (as of September 2013) that duloxetine not be routinely offered as first line treatment, and that it only be offered as second line therapy in women wishing to avoid therapy. The guideline further states that women should be counseled regarding the drug's side effects. Hypersensitivity - duloxetine is contraindicated in patients with a known hypersensitivity to duloxetine or any of the inactive ingredients. MAOIs - concomitant use in patients taking MAOIs is contraindicated. Uncontrolled narrow-angle glaucoma - in clinical trials, Cymbalta use was associated with an increased risk of mydriasis (dilation of the pupil); therefore, its use should be avoided in patients with uncontrolled narrow-angle glaucoma, in which mydriasis can cause sudden worsening. CNS acting drugs - given the primary central nervous system (CNS) effects of duloxetine, it should be used with caution when it is taken in combination with or substituted for other centrally acting drugs, including those with a similar mechanism of action. In a trial for major depressive disorder (MDD), the most commonly reported treatment-emergent adverse events among duloxetine-treated patients were nausea (34.7%), dry mouth (22.7%), headache (20.0%) and dizziness (18.7%), and except for headache, these were reported significantly more often than in the placebo group. In a long-term study of fibromyalgia patients receiving duloxetine, frequency and type of adverse effects was similar to that reported in the MDD above. Side effects tended to be mild-to-moderate, and tended to decrease in intensity over time. anhedonia are also possible. Frequency of treatment-emergent sexual dysfunction in long-term treatment has been found to be similar for duloxetine and SSRIs when compared in clinical trials, while there is some evidence that duloxetine is associated with less sexual dysfunction than escitalopram when measured at 4 and 8 weeks of treatment. Reported adverse events which were temporally correlated to duloxetine therapy include rash, reported rarely, and the following adverse events, reported very rarely: alanine aminotransferase increased, alkaline phosphatase increased, anaphylactic reaction, angioneurotic edema, aspartate aminotransferase increased, bilirubin increased, glaucoma, hepatitis, hyponatremia, jaundice, orthostatic hypotension (especially at the initiation of treatment), Stevens–Johnson syndrome, syncope (especially at initiation of treatment), and urticaria. During marketing of other SSRIs and SNRIs, there have been spontaneous reports of adverse events occurring upon discontinuation of these drugs, particularly when abrupt, including the following: dysphoric mood, irritability, agitation, dizziness, sensory disturbances (e.g., paresthesias such as electric shock sensations), anxiety, confusion, headache, lethargy, emotional lability, insomnia, hypomania, tinnitus, and seizures. The withdrawal syndrome from duloxetine resembles the SSRI discontinuation syndrome. In placebo-controlled clinical trials of up to nine weeks' duration of patients with MDD, a systematic evaluation of discontinuation symptoms in patients taking duloxetine following abrupt discontinuation found the following symptoms occurring at a rate greater than or equal to 2% and at a significantly higher rate in duloxetine-treated patients compared to those discontinuing from placebo: dizziness, nausea, headache, paresthesia, vomiting, irritability, and nightmare. In 2005 the United States FDA released a public health advisory noting that there had been 11 reports of suicide attempts and 3 reports of suicidialty within the mostly middle-aged women participating in the open label extension trials of duloxetine for the treatment of stress urinary incontinence. The FDA described the potential role of confounding social stressors "unclear". The suicide attempt rate in the SUI study population (based on 9,400 patients) was calculated to be 400 per 100,000 person years. This rate is greater than the suicide attempt rate among middle-aged U.S. women that has been reported in published studies, i.e., 150 to 160 per 100,000 person years. In addition, one death from suicide was reported in a Cymbalta clinical pharmacology study in a healthy female volunteer without SUI. No increase in suicidality was reported in controlled trials of Cymbalta for depression or diabetic neuropathic pain. Duloxetine inhibits the reuptake of serotonin and norepinephrine (NE) in the central nervous system. Duloxetine increases dopamine (DA) specifically in the prefrontal cortex where there are few DA reuptake pumps via the inhibition of NE reuptake pumps (NET) thus allowing greater diffusion of DA in this brain region. However, duloxetine has no significant affinity for dopaminergic, cholinergic, histaminergic, opioid, glutamate, and GABA reuptake transporters and can therefore be considered to be a selective reuptake inhibitor at the 5-HT and NE transporters. Duloxetine undergoes extensive metabolism, but the major circulating metabolites do not contribute significantly to the pharmacologic activity. Absorption: Duloxetine is acid labile, and is formulated with enteric coating to prevent degradation in the stomach. Duloxetine has good oral bioavailability, averaging 50% after one 60 mg dose. There is an average 2-hour lag until absorption begins with maximum plasma concentrations occurring about 6 hours post dose. Food does not affect the Cmax of duloxetine, but delays the time to reach peak concentration from 6 to 10 hours. Distribution: Duloxetine is highly bound (>90%) to proteins in human plasma, binding primarily to albumin and α1-acid glycoprotein. Volume of distribution is 1640L. Metabolism: Duloxetine undergoes predominately hepatic metabolism via two cytochrome P450 isozymes, CYP2D6 and CYP1A2. Circulating metabolites are pharmacologically inactive. Elimination: Duloxetine has an elimination half-life of about 12 hours (range 8 to 17 hours) and its pharmacokinetics are dose proportional over the therapeutic range. Steady-state is usually achieved after 3 days. Only trace amounts (<1%) of unchanged duloxetine are present in the urine and most of the dose (approx. 70%) appears in the urine as metabolites of duloxetine with about 20% excreted in the feces. Duloxetine was created by Lilly researchers. David Robertson; David Wong, a co-discoverer of fluoxetine; and Joseph Krushinski are listed as inventors on the patent application filed in 1986 and granted in 1990. The first publication on the discovery of the racemic form of duloxetine known as LY227942, was made in 1988. The (+)-enantiomer of LY227942, assigned LY248686, was chosen for further studies, because it inhibited serotonin reuptake in rat synaptosomes to twice the degree of the (–)-enantiomer. This molecule was subsequently named duloxetine. In 2001, Lilly filed a New Drug Application (NDA) for duloxetine with the US Food and Drug Administration (FDA). However, in 2003, the FDA "recommended this application as not approvable from the manufacturing and control standpoint" because of "significant cGMP (current Good Manufacturing Practice) violations at the finished product manufacturing facility" of Eli Lilly in Indianapolis. Additionally, "potential liver toxicity" and QTc interval prolongation appeared as a concern. The FDA experts concluded that "duloxetine can cause hepatotoxicity in the form of transaminase elevations. It may also be a factor in causing more severe liver injury, but there are no cases in the NDA database that clearly demonstrate this. Use of duloxetine in the presence of ethanol may potentiate the deleterious effect of ethanol on the liver." The FDA also recommended "routine blood pressure monitoring" at the new highest recommended dose of 120 mg, "where 24% patients had one or more blood pressure readings of 140/90 vs. 9% of placebo patients." After the manufacturing issues were resolved, the liver toxicity warning included in the prescribing information, and the follow-up studies showed that duloxetine does not cause QTc interval prolongation, duloxetine was approved by the FDA for depression and diabetic neuropathy in 2004. In 2007, Health Canada approved duloxetine for the treatment of depression and diabetic peripheral neuropathic pain. Duloxetine was approved for use of stress urinary incontinence (SUI) in the EU in 2004. In 2005, Lilly withdrew the duloxetine application for stress urinary incontinence (SUI) in the U.S., stating that discussions with the FDA indicated "the agency is not prepared at this time to grant approval ... based on the data package submitted." A year later Lilly abandoned the pursuit of this indication in the U.S. market. The FDA approved duloxetine for the treatment of generalized anxiety disorder in February 2007. Cymbalta generated sales of nearly $5 billion in 2012 with $4 billion of that in the U.S., but its patent protection terminated January 1, 2014. Lilly received a six month extension beyond June 30, 2013 after testing for the treatment of depression in adolescents, which may produce $1.5 billion in added sales. The first generic duloxetine was marketed by Dr. Reddy. Brand names include: Ariclaim, Dimorex ,Xeristar, Yentreve, Duzela, Dulane, Cymbalta, Coperin (in Australia, manufactured by Alphapharm) and Cymgen (in South Africa). ^ National Institute for Health and Clinical Excellence. Clinical guideline 40: Urinary incontinence. London, 2006. ^ National Institute for Health and Clinical Excellence. Clinical guideline 96: Neuropathic pain - pharmacological management. London, 2010. ^ Cymbalta package insert. Indianapolis, IN: Eli Lilly Pharmaceuticals; 2004, September. ^ Stahl, S. (2013). Stahl's essential pharmacology, 4th ed. Cambridge University Press, New York. p. 305, 308, 309.